Last week, my team at The Telegraph launched our first data-led game. It allowed our readers to forecast the Russia 2018 World Cup by scoring six factors by their importance in the world’s biggest footballing event. The result would be a personalised projection of the competition based on what the reader thinks is important, as opposed to an austere "The Telegraph Predicts The World Cup" style of forecasting. To do this, myself and Patrick Scott had to collect a variety of data on six key areas for each team. Each of these six areas took in anything from one to six metrics to ensure that the final summary figure was a robust and accurate representation of how good that team is in that area. You can now see this data here. It gives each of the 32 teams a summarising score for each of the six areas, and then scales it to provide a score between zero and one. We’ve written a bit of detail on the figures we had to dig into to get a final score for each of the six factors below. This includes the relative weightings we applied to each of the individual metrics, as some areas were deemed to be more important than others. Once we’d worked out all of these weightings, we had one final score for each of the six factors across the 32 teams. This is where the reader comes into play. We asked the reader to score the importance of each of these factors from one to five, which then provides a multiplier. This introduces the “game” element of the forecaster. To generate the winner of the tournament, we add the six newly-weighted figures together and get a final score. Each weighting has a random margin of five percentage points, to help mimic the randomness of any one World Cup game (this is in addition to the randomness of the actual “random luck” category). Once this is done, we simulate the progression of the World Cup, with the team with the highest score in any one game beating the lower-scoring team until we get to the final. So far, Germany have come out on top in 42 per cent of simulations, while Brazil are second-best on 25 per cent. England come out at zero per cent, but the Three Lions have still had several dozen wins. Even though Germany and Brazil collectively share two third of the outcomes in our forecasting game, we worked hard to make sure that these two favourites didn’t dominate the game. After all, countries like Spain, France, Portugal or Argentina all have a decent shot at the tournament. And with luck on their side, any team technically could win their next seven games and lift the trophy. This is why we added two elements of randomness: first, the actual randomness score, and secondly, the randomness margin of ten percentage points on any one weighting. We also ensured that we had categories that favoured other teams. While favourites Brazil and Germany dominate odds and manager pedigree, France performs best at player pedigree, and Spain's recent good run means that their form score is highest. So Germany will indeed likely win if you score the importance of manager pedigree and odds categories highly. But you’d likely get France (the winner in 10 per cent of simulations) winning if you gave player pedigree the highest weighting. You get the idea. We wanted this to be a game, so it was important that readers could go back and, by changing a couple of key metrics, there would be noticeable and interesting changes in how the World Cup progressed. Currently the metrics are indicating that readers are indeed running the simulation multiple times to see who else they can get winning the competition. After every stage of the tournament, we’ll update our data to reflect the latest picture. This will most likely impact the form and player categories the most. If, for example, Argentina score five goals in their first game against Iceland, or equally if Messi gets injured in that game, their odds of progressing in both the World Cup and our simulations will be impacted. This way we ensure that our game stays relevant throughout the competition. If you’re interested in finding out more about how this all works, check out our data or contact myself or Patrick. General Elections are a time when all UK - and many international - newsrooms get to roll out the best of their data, graphics, development and innovation teams to cover a key political event. We all create some graphics that are the same, or at least very similar, to cover the key statistics of the results night. These include some form of bar chart to show the total number of seats; a map to show the geographical distribution of the vote; and usually another bar chart or similar graphic to show the total vote share and swing between parties. But the most interesting things for me, as a data journalist, are what the newsrooms do differently. How did each individual team think to innovate and change how they cover the election? How did they learn from what every team did in the last election? And how have we all collectively, in the data and graphics community, developed political reporting further? And also - how did each newsroom do all of this on the strict deadline of weeks that a snap election gives us? The FT's team created several slope charts in their General Election results page, which helped tell the individual stories of constituencies: who won them; whether they swung; and how big the movement was in them. Not only did they use slope charts to highlight the swing at a national level, but the graphics were also used for individual constituencies. Their results page immediately highlights some of the key highlights of the night, with slope charts accurately and quickly portraying, for example, Kensington's shock swing from Conservative to the Labour. It shows the huge gap between the two major parties and the razor-thin gap between them after the election in Kensington. The slope chart highlights this movement accurately in an easy-to-understand way, and is probably the best way I saw of visualising such movement in the election. The Times' digital team has already written about their results page, telling us the decisions they went through in order to achieve the final outcome. An election graphic I valued from them was the ternary the team used to show "how Britain was more polarised than ever". The gif of the plot was used on social media to show the movement between elections. 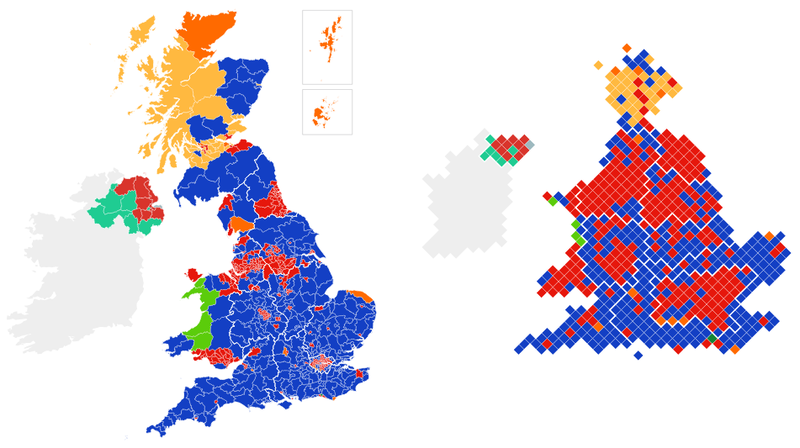 From 2005, the gif plots the movement between each General Election. In the movement between 2015 and 2017, for example, the ternary is used effectively to highlight the big picture of the night - the movement towards Labour all over the board, the movement towards the Tories in certain seats, and the big swings towards the Conservatives in Scottish seats. Using multiple axes in this way shows the multiple angles of an election: we are not living in a two-party political system, and so a ternary was a good call to show the complexity and multiplicity of movements in vote share between the parties. Instead of using a bar chart or stacked bar chart, which most newsrooms used, Bloomberg opted for a grid plot. It is a simple visualisation, which fulfils a very similar function to the bar charts (with a majority target line) that we used at the Telegraph. However, the way in which they broke up each bar into boxes helps portray the composition of Parliament and its 650 constituencies. It shows - as it should - that the election is actually 650 individual elections, complete of 650 first-past-the-post races, which then built the new Parliament. With a line in the middle of the boxes, we can see the exact number of seats each party needed to claim a majority - the Tories were just nine seats short of a majority (excluding the Speaker). The Economist's stand-out quality was the tabulated format of their results dashboard, which allowed the reader to toggle between the General Elections of 2017, 2015 and 2010 - as well as the 2016 EU referendum. This is a simple but effective way of contextualising the story of the 2017 General Election, which allowed the reader to easily compare it with previous electoral events in the UK. You could, for example, easily know the voting history of your own constituency, and find out how much of a shock its 2017 result was. 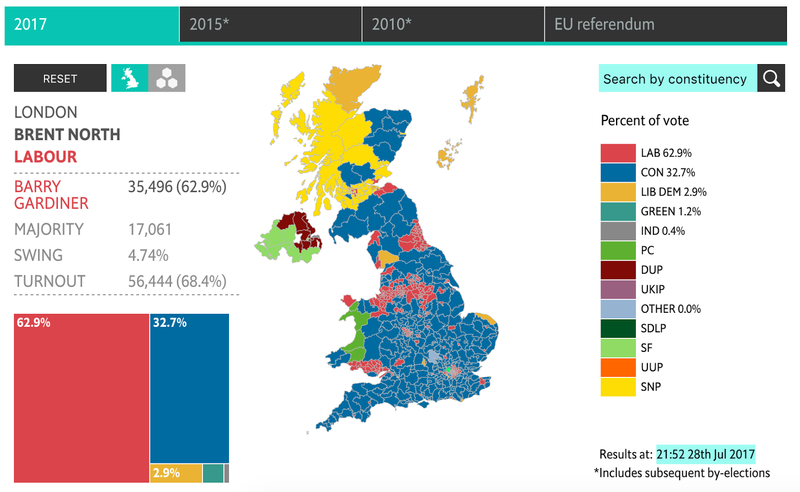 It also now acts as a great dashboard for anyone wanting to find out what happened nationally or in any constituency for the last four national votes in the UK, giving people the facts and stories they need to make sense of the modern political landscape. 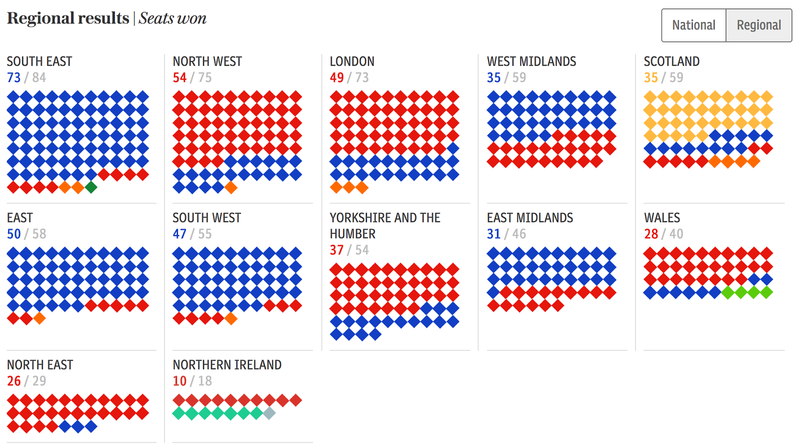 The BBC's visual team are always among the best when it comes to electoral results visualisations - and again their were consistent, accurate and to-the-point. 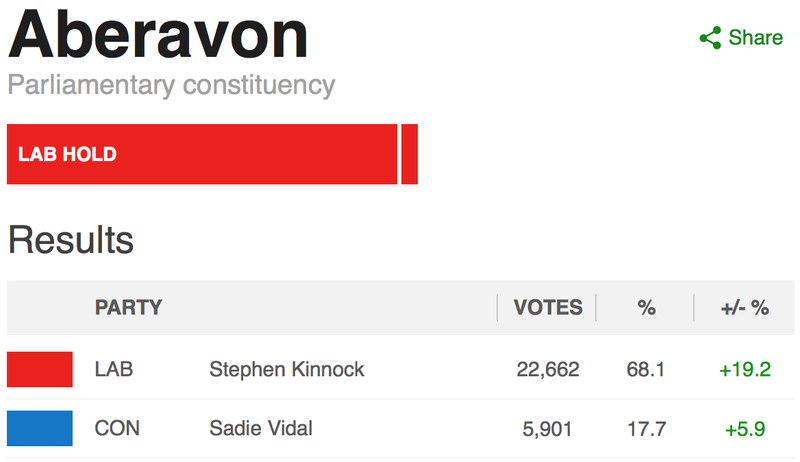 Their individual constituency pages simply and effectively communicates the results of each seat - for example, how Labour's Stephen Kinnock gained 22,662 votes in Aberavon. I really enjoyed how they married together such graphical content with a localised live blog for each constituency, really bringing the General Election home to each of their readers. The BBC's visual teams didn't do anything incredibly out of the visualisation box for the election, but this is to be commended, as they didn't need to do anything differently - all their graphics and their website structure worked effectively and successfully at telling the story of the night. The Guardian's results page used an interesting visualisation to group constituencies together based on their relatively 'safety' - their potential to swing between parties. Each parties' seats were grouped in small multiple gridplots - split up between vulnerable (majority of 0-10%), safer (majority of 10-20%) and safest (majority of 20-30%) constituencies. One difficulty I had with this graphic was trying to make sense of it as it was auto-updating throughout the night, as most were grey and so it was hard to see the point, but by the morning it was a great way to show the story of the night. The graphic perfectly shows how, contrary to expectations, Labour held most of its seats; how the Tories unexpectedly lost lots of their vulnerable seats but even, startlingly, one of their safest seats; and how the SNP suffered a bloodbath and lost seats of majorities of over 20%. It was the best way I saw of communicating such information. Our own results dashboard at The Telegraph also used small multiple gridplots like the Guardian, but this was to group constituencies by their geography instead of safety. Using our own Telegraph-style diamonds, our idea was to show the geographical divides that dominate the UK: the Tories' dominance in the south; the supposedly-under-siege Labour strongholds of the north; and Scotland's backing of the SNP. Of course, not all of these stories came to pass, and our visualisation show these stories. For example, we can easily see that the Scotland gridplot is a lot more diverse - and blue - than expected, meaning that the night was a bad one for the yellow of Nicola Sturgeon. I think grouping constituencies in this way was effective, as it pushed the geographical divisions further - it have readers answers that they'd have to spend a lot of time searching for in a map or even a cartogram. By grouping constituencies by region in their own grid, the reader is immediately able to see which party could claim dominance in specific areas in a way that would take much longer in a map. For the next election, I'd like to go further with this type of visualisation. It would be good to show the swings of certain seats in these regions, like The Times and Economist did effectively, while also integrating the Guardian's idea of grouping constituencies by the safety of their previous majority.